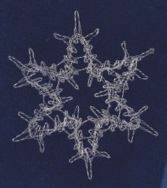 There was so much interest in the wire lace star that Bryce taught in November 2015, she kindly offered to share the pricking and instructions. Blue painter’s tape. Small rubber bands. Handling: Roll wire onto & off bobbins, no wrapping or twisting or half-hitches. To smooth small wrinkles or bends, press wire between thumb and finger. Keep bobbins on short leashes. Tension firmly; you may find it easiest to pull directly on wire. Avoid kinks. Work carefully; wire does not like to be redone. Start: Starting from center of snowflake, place bobbin pairs #1-3 on starting pins. Place bobbin pairs #4 & #5 side-by-side on last pin. Cloth stitch #5 through #4, twist 2x, twist again at pin, twist 2x on return. Work Pricking: All is worked in cloth stitch. Twist 2x around any pin. The long loops need at least 5 twists: 2 going out, 1 at pin, 2 coming back. But it’s your choice depending on the effect you want. Wire breaks: Simply twist wire back together. You will trim join and tuck away discretely later. Finish: Work all the way back to the start. From the center, taking each pair in turn, cut wires 3-4” long from bobbin. Poke wire through starting loop from underneath then twist the pair together. Cut to about ¼”. When all are twisted and cut, tuck twists unobtrusively into lace. Getting Fancy: Add beads, glitter, metallic cords, etc. Limited only by your imagination! Sources of wire & Supplies: Both Parawire and Artistic wire are craft wires available from the manufacturer (parawire.com or artisticwire.com) or from various craft/jewelry/art suppliers. The wire used here was ordered from Lenka Suchanek’s shop “WireLaceSupplies” on Etsy. I highly recommend her; she is super easy to deal with. She also sells wire lace bobbins, etc. Her bobbins use special elastics to hold the wire at the top of the bobbin – rubber bands aren’t quite as nice but will do!